Britain's Andy Murray overcame a second-set blip against Teymuraz Gabashvili to win 6-1 7-5 in the Shanghai Masters first round. The two-time champion took little time to take the first set, but numerous forehand errors in the next set saw him struggle to get over the line. The world number 11 also complained about the Russian qualifier's grunting in a match that lasted 84 minutes. The 27-year-old will play world number 37 Jerzy Janowicz in his next match. "I started the match well - I was dictating a lot of the points and using good variety," said the former Wimbledon champion. "At the beginning of the second set there was sloppiness on my serve. Murray is currently ninth in the race to reach the November ATP Finals - the top eight qualify for the season-ending event. However, Murray might need to rise to seventh with the eighth spot going to a 2014 Grand Slam champion ranked between eighth and 20th. Croat Marin Cilic, who won the US Open, is currently ranked sixth. "I started using variety towards the end. The short slice started working better. It was a good start for me, but there is a lot of work to be done." 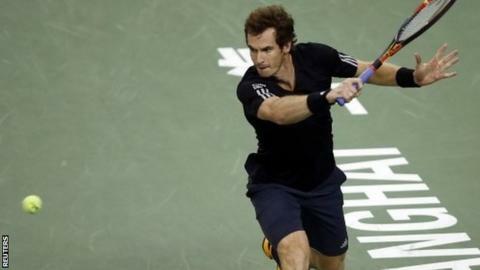 Murray defeated Janowicz at the China Open last week, but only after recovering from a set behind. "Hopefully, I'll be able to start against Jerzy a little bit better," he said. "I'll try to play solid from start to finish and not give him too many opportunities." On Tuesday, the Scot began brilliantly in his first ever meeting against the Russian. He broke the 29-year-old on three occasions in the opening set, including the first game, with points won on first and second serves hitting above 80%. However, the two-time Grand Slam champion's level dropped significantly in the second. He made three double faults in the set, one to give the Russian his first break, while he failed to find his range with his forehand. It was three errors on that side that helped Gabashvili achieve his second break, as Murray complained bout being distracted by the crowd and his opponent's grunting. But he regained his composure, and a brilliant short backhand slice on the Russian's serve levelled the scores at 5-5. He broke Gabashvili again in the 12th to secure the victory. Elsewhere, Italian world number 17 Fabio Fognini lost to Chinese wildcard Wang Chuhan - ranked 536 places below him. Chuhan won 7-6 (7-5) 6-4 in the opening round. After the two shook hands at the end of the match, Fognini gave his 22-year-old opponent a little shove with his arm as they crossed paths, then showed his middle finger to the crowd upon exiting the stadium. Read more on Andy Murray: Emotional Shenzhen Open win after "very tough week"